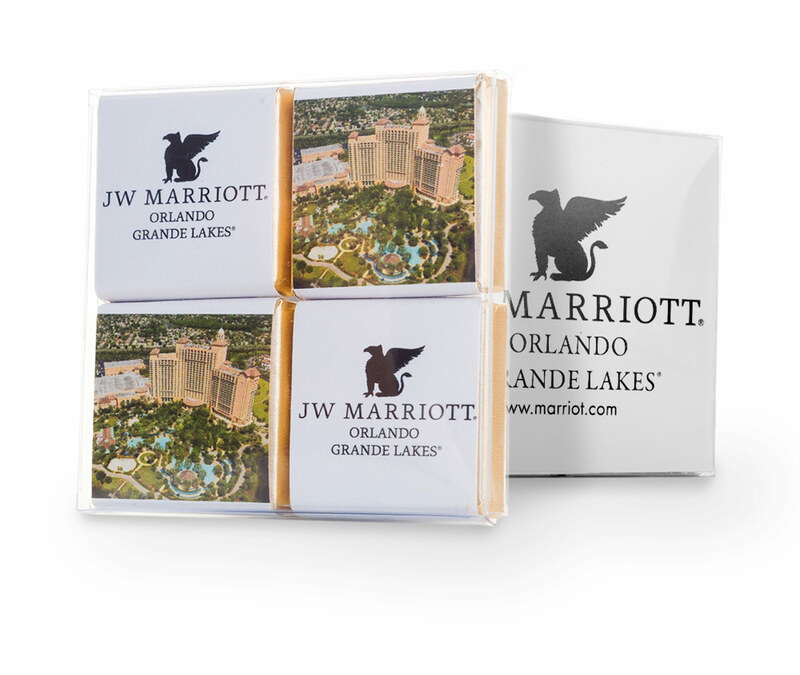 Size: Each square is 1.25" x 1.25" | Each set is 2.5" x 2.5" x .25"
Leave a sweet impression with four customized chocolate squares in an elegant clear box showcasing your logo from all angles. A full color card is added to the back of each set, allowing for extra space to print contact information, promote new items, and communicate your message. Each box offers a combination of creamy milk and rich dark chocolates, bringing a taste of Belgium to your recipients. These boxes make the perfect goody bag addition, personalized business gift, and after sales thank you gift. This set features four of our popular custom chocolate squares in an elegant clear acetate box. Unlike other manufacturers on the market, we use the highest quality Belgian chocolate for our products to make sure you leave the best possible impression on your audience. What makes Belgian chocolate unique is the quality of ingredients and an almost fanatical adherence to Old World manufacturing techniques. 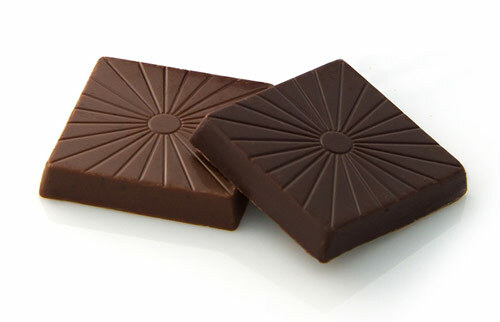 You can get your set made with Belgian dark or milk chocolate or a combination of both (2 dark, 2 milk squares). Each chocolate square is first wrapped in your choice of gold or silver foil. A second paper gloss layer is used to customize the squares with your full-color artwork. 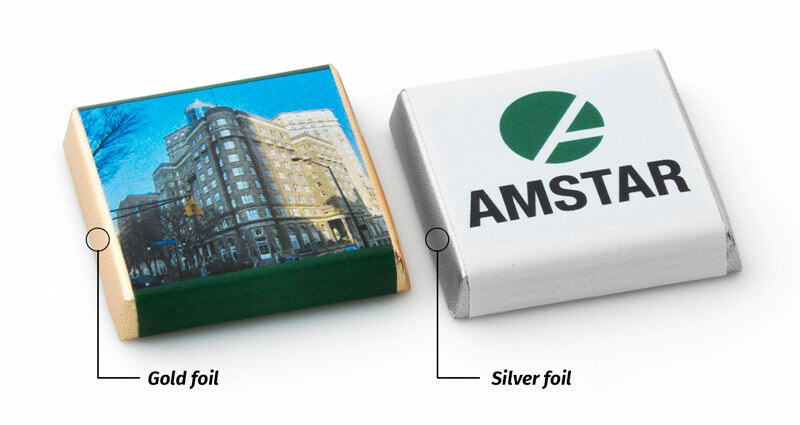 Our chocolate square sets give you extra space for your branding and marketing messages. Each set comes with a full-color card that is inserted in the back of the packaging (see example picture). 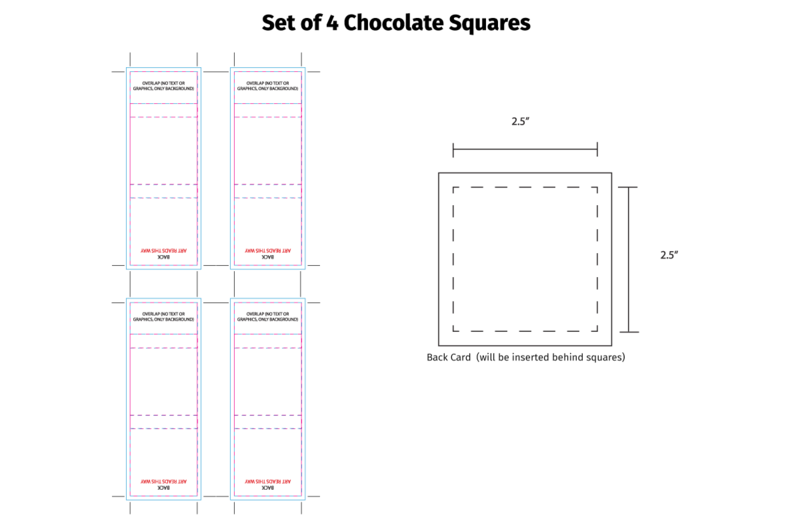 For your convenience, we have created layout templates for all of our products. If you are not comfortable with graphic design programs or have any questions about the artwork process, please reach out to us and we will get everything set up for you at no additional cost. Excellent. Very quick turn around, will absolutely use them again. Clients loved it. Very nice presentation and taste. - This item comes with 4 individually wrapped squares and a printed card, you can choose up to 4 images for the wrappers and a fifth image for the card.